Exploring ancient sites brings a special thrill to those of us able to resurrect all that rubble. Get even more out of the ancient world’s wonders with a little advance planning. Climbing the Acropolis, communing with the druids at Stonehenge or marveling at the sprawling remains of Pompeii — exploring the remnants of Europe’s distant past brings a special thrill to those of us able to resurrect all that rubble. I had such a thrill recently in Epidavros, where I visited the finest and best-preserved of Greece’s many ancient theaters. With my travel partner sitting in the top row of the stony grandstand, I stood alone in the center of the stage and, with a clap of my hands, demonstrated its 2,400-year-old acoustics. The theater here is part of a larger “sanctuary” — Epidavros was something of a luxury spa for people in need of a cure, complete with temples, baths and a beautiful theater. It’s in such good shape that the theater is still used for performances today. The grandeur of a well-preserved monument like the Epidavros theater is easy enough to appreciate even if it’s been a while since your last history class. Most ancient sites are more ruined — and therefore harder to imagine in their prime. The Roman Forum is a good example. You know it was important — the common ground between the fabled seven hills of ancient Rome. But today what’s left is little more than foundation stones and a few broken columns. The challenge is to envision the Forum in its day. 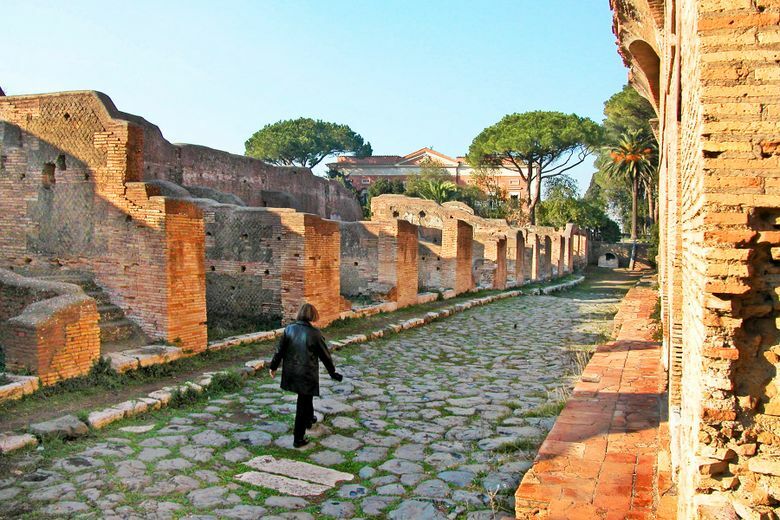 Stand along the Via Sacra — the Sacred Way — on the same stones the masses did as Rome’s military victors paraded by, displaying their booty and plunder. Imagine spitting into the cage of a barbarian king as it jostles by. If you squint, you may be able to make out the carvings on the top of a towering triumphal arch, a reminder that your emperor is a god on earth and you are lucky to be his subject. It’s hot and it’s dusty, and there are sweaty tour groups all around you. But if you can imagine the ancient stones supporting ancient life, it’s an unforgettable experience and a trip highlight. In my student days, I bummed through Greece’s Parthenon surrounded by people who looked like they were having a good time — and who, I was convinced, were faking it. Two years later, after a class in ancient art history, I understood how Greek society was designed. I could imagine Pericles, the ultimate Athenian statesman, hard at work. I could see Socrates enjoying the shade of the colonnade. And I could fill the now-empty niches with brightly painted statues of Greek gods and goddesses. Clearly, there are two kinds of sightseers: those who know what they’re looking at … and those who don’t. But you don’t have to go back to school to be informed. There’s plenty of information available for people who bring only a healthy dose of curiosity to the ancient sites. Local souvenir books show the ancient site “then and now” — enabling you to imagine it filled with people. Most sites also rent out audioguides that provide a fine self-guided tour (just punch in the number you see as you wander to hear a narration about a particular work of art or structure). And private guides are almost always available for hire. In anticipation of your visit, it can also be hugely helpful to do a little homework: Do some reading or watch a movie or documentary to get background and insight into the ancient wonders you’ll be exploring. Archaeological areas are being excavated all the time. In fact, many of the sites you’ll see are only partially uncovered. And the finest of the discovered statues, mosaics, and frescos are generally out of the weather and acidic air (and the reach of 21st-century vandals), and safely in state-of-the-art museums on-site. Be sure to approach ancient ruins as a two-part experience: First, tour the museum to see the treasures and get context for the culture and life in that place and time. Then, with that newfound ability to understand what you’ll be seeing, venture out to the actual excavation site. With more people than ever touring Europe’s great ancient sites (including literally millions of sightseers on cruise-ship excursions), congestion has become a major concern. If advance online reservations are recommended, consider them required. If you can get a ticket with a timed entry, it’s smart to do so. Otherwise, going early or late is a good way to avoid the big tour groups that jam many ancient sights between 10 a.m. and 4 p.m.
Europe is better than ever at protecting and sharing its ancient patrimony. And if you approach its ancient wonders thoughtfully, you’ll bring home an appreciation of the artistic wonders of antiquity and life-long memories.